Luke was sitting next to me while I was on Pinterest the other day (I know, I know, great Mother/Son bonding time, right?!). He saw this Walrus craft as I was browsing and he decided his life would not be complete if we didn’t make it. After two days of non-stop bugging me and a trip to the library, we not only made this adorable craft, but we learned a lot about Walruses as well! I did want to give you a couple tips if you decide to do this craft though. Danielle’s directions say to glue the paper plates together. If you are inpatient like me and my boys, don’t waste your time with school glue. Pop out the glue gun. Also, we didn’t glue in the tusks (plastic spoons) in the muzzle before we painted, as her directions said to. I knew painting would be messy for my preschooler, so we opted to glue on the muzzle and add the tusks after the Walrus was painted and dry. I used the glue gun for the tusks as well. 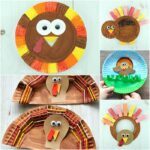 If I was going to do this craft with a class, I would probably have the paper plates all assembled, ready to paint to help with time. I think I would also consider using staples to put the paper plates together instead of glue. You wouldn’t see the staples anyways once it is all painted. 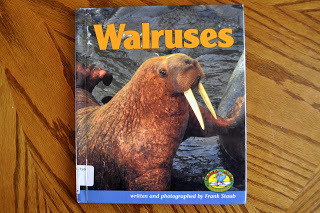 I was disappointed that I could only find one children’s picture book with a Walrus as the subject. Turns out, it was a wordless book too. If you know of any fiction Walrus books, I would love some suggestions for future use. Although wordless, it was fun to make up words for each page with my preschooler. It is about a Walrus that escapes from a Zoo and the Zookeeper searches all over town for the Walrus. The Walrus was really good at disguising himself in each scene, which makes this book really fun. 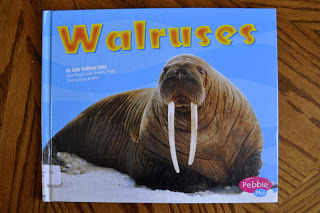 This is a perfect non-fiction book about Walruses for preschoolers age 3-4. There is one paragraph on each page with facts and info on Walruses. Just enough information for preschoolers to stay interested and not be too bored. This was the perfect book for Luke, who just turned 5. I would recommend it for ages 4-7. It has a lot more detailed info and facts about Walruses. I feel like Luke learned a lot from this book and he loved all the photographs of the Walruses. I asked him after we were finished with our craft what he learned about Walruses and he said, “If a Walrus gets too cold he turns white and if he gets hot he turns pink.” I liked how this book showed pictures of the Walruses white and pink so he really grasped that concept. I love that you had "bonding time" over Pinterest! Lol! Super cute craft! 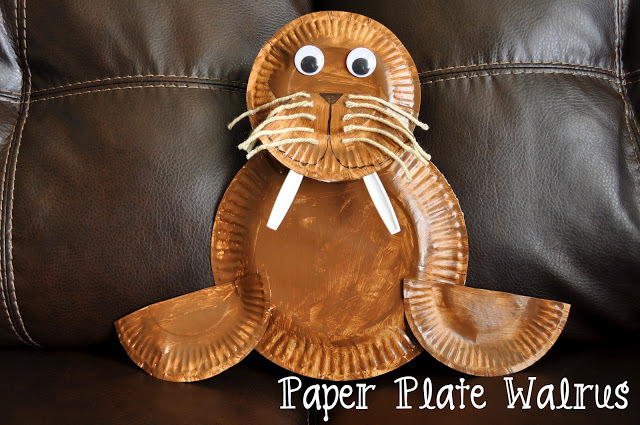 Cutest walrus craft ever. Seriously in love. I'm going to use this to go along with the book Tooth Trouble. Super cute story, the main character is a walrus 🙂 Thanks for sharing! Love your art project! 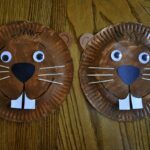 I featured it in my "Art Projects on a Budget for Montessori Environments #1" with a link back and your button (let me know if I can add one of your great walrus art pics)! I LOVE HIM!!!!! Such a great project!!! What a great project, Rachel! Thank you for sharing at Sharing Saturday!! I hope you will share with us again this week! Adorable! Just pinned this cute little guy! This is adorable!! I found your blog from the Blog Hop…I'm your newest follower! Oh man…this is too cute!! I foresee a weekly theme where I could use this VERY soon…;) You are so awesome, thanks for inspiring me once again!! I LOVE this Walrus!! 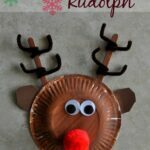 It is amazing how great he looks and all you used was paper plates!! I am featuring this at TGIF this week – http://livinglifeintentionally.blogspot.com/2012/02/tgif-linky-party-18.html – Thanks for linking up & sharing your creativity with the rest of us =-) Come on by and link up what you've been up to this week! Hi, I am the creator of the walrus craft. I love yours, it came out cuter than mine. Thanks for giving Danielle's Place the credit for the craft and a link back to my site, but I would prefer you take off the directions showing how to make the mouth and link back to Danielle's Place for the directions. The mouth is the only part that is complicated and you would need the directios for. 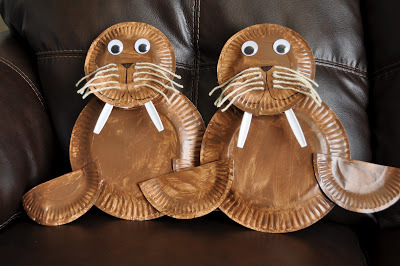 I am so glad that people are finding this craft useful and using it to teach children about walruses. I had no idea it would be so popular. 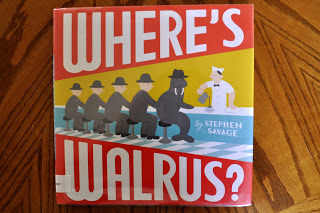 I know this is an old post, but wanted to share our families favorite walrus book Walpole, by Sid Hoff. Thank you! I will have to check that one out! Could you show making a hippo? My husband is Wally Walrus and I am Hilda Hippo.